This is an example of how an excellent texture pack should look, which only improves the game. 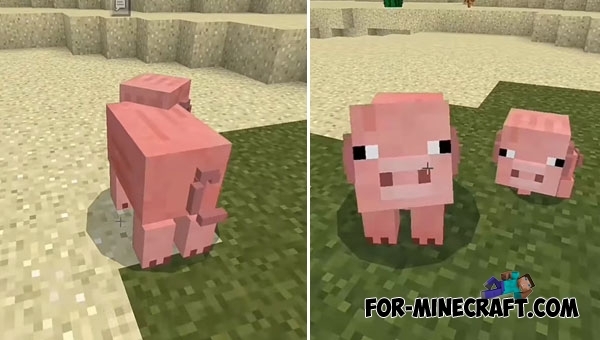 It adds more details to the existing mobs in Minecraft PE. We notify that the pack is at the initial stage of development and contains several mobs (the current version at the very bottom). You will see detailed pigs, chickens and skeletons: each of them has been modernized and now they look more interesting that makes you look narrowly and approach them closer. Pigs: a new pig's tail and small ears. Skeletal creatures: a quiver and three 3 arrows, an empty head with transparent eyes. Cows and sheeps: horns (like a bull). This is just a test version of the pack and it is intended for evaluation. Definitely, if the players like these 3D mobs then the creator will improve all the creatures in turn. How to install 3D Mobs?